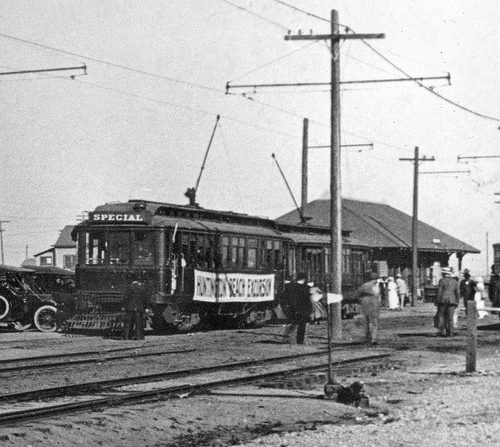 A Pacific Electric interurban with a “Huntington Beach Excursion” banner draped on its side rests with another unit at the Huntington Beach Station in 1915. The car behind the “Special” appears to be a 200 class Huntington Standard in local service. At that time two local lines operated out of Huntington Beach. One was the Huntington Beach to La Bolsa Line. This line mainly served to transport Holly Sugar employees to their work at the sugar mill near what is now Main St. and Garfield Ave. The second line was the Santa Ana – Huntington Beach Line. This side of the road interurban line took a meandering route North and East from Huntington Beach through what is now Fountain Valley to Santa Ana Station located at 4th St. and Mortimer. Portions of the line in Santa Ana are now a bicycle trail. Passenger service on both of these local lines was abandoned by the mid 1920’s.